'Boozy Monkeys’ Bad Behavior - not just humans! Be prepared to laugh your socks off when you check this link out! These booze-snatching monkeys behave funny just like humans: knocking over glasses, falling off tables, stumbling home, rolling around on their backs hysterically. However none of them have yet been witnessed singing karaoke or throwing a punch at a nightclub bouncer – for now these are human-only alcoholic activities. 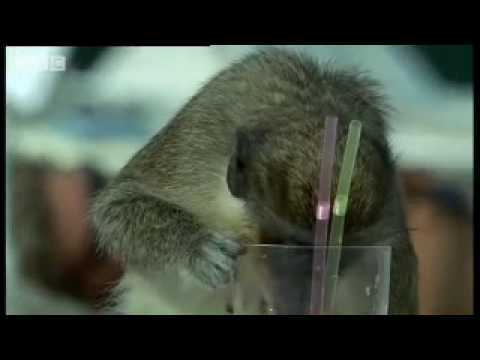 This weirder-than-weird BBC documentary shows how on the Caribbean paradise island of St Kitts, cheeky vervet monkeys have been stealing the local grog and turning into booze-hounds. Originally imported from Africa during the slavery period, these crazy mammals got a taste for the sauce by drinking sugar cane left to ferment in the fields around them. wine and cocktails from local resorts. There’s a great scene in this where one monkey hurtles down a tree, onto the beach and straight up to an unsuspecting sunbather. While the victim is face-down in the sand, this smooth operator sticks its head right into her cocktail and sups away. Another one deftly plucks a plastic cup off the beach and runs away with it without losing any of the ‘amber nectar’ inside. The monkeys’ drinking habits mirror humans’; while some of them will go to any length for liquor, others are teetotallers who prefer soft drinks, knocking over bottles of Orangina to get at that tasty bright liquid. Perhaps these particular monkeys are the ‘designated drivers’. Studies of these funny vervets have yielded useful info about human alcoholism, with the conclusion that a liking for the booze is determined mainly by our genes. is that the harder the drinker a monkey is, the more respected and trusted leader he or she becomes. If there is a human parallel to this then it must be the Russian people who elected Boris Yeltsin, a world leader who regularly embarrassed himself after a tipple. There have been similar cases of other animals with a taste for alcohol but few can match these Caribbean monkeys for their monkeying around! « Wanna be Navy Officer, chooses wrong job as Airforce Helicopter Pilot!